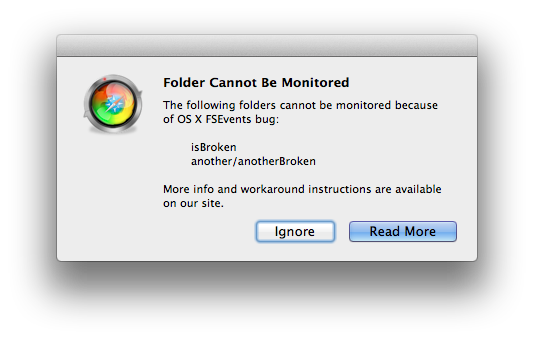 OS X has a rarely-occuring bug that causes some folder to get ‘broken’ with regards to file system change monitoring via FSEvents. In case you wonder, the bug is related to case (in)sensitivity of the file system. For certain folders, either realpath or FSCopyAliasInfo APIs report their names in incorrect case. This somehow causes the FSEvents system (used by LiveReload to monitor file system changes) to never report any changes for those folders and their subfolders. If these steps do not work, please let us know! In fact, if they worked, please give us a note too, indicating which of them has worked for you.